If you have an office job, then you likely spend over 40 hours a week at the office, completing projects and meeting deadlines. Because of all of this work, it is no wonder that by the end of the month, you can find yourself digging through papers and moving clutter to find what you need. As you’ve likely already experienced, having a clean and organized desk can give you a clear head and boost productivity. 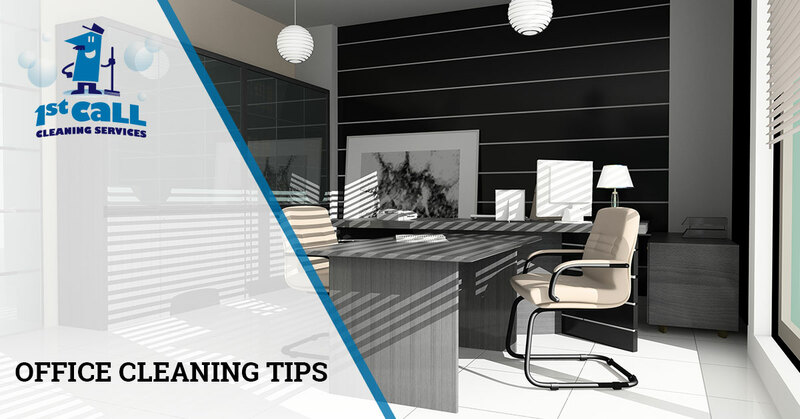 To help you get started on your office cleaning, San Antonio’s go-to cleaning company would like to share with you some simple tips. If your office is in need of commercial cleaning services, let the experienced cleaning team at 1st Call Cleaning Service help. We’re so confident in our cleaning services that we offer free a 14-day trial, and we never require our clients to sign a contract, which means you can cancel at any time for no cost. Learn more about us and give us a call today at 210-504-3415. Have you ever stopped to think about how dirty your keyboard is? If you haven’t, you probably don’t want to do this until after you’ve cleaned it — unless, of course, you need some serious motivation to start cleaning. According to this CBT Nuggets study, a keyboard and mouse is more than 20,000 times dirtier than a toilet seat. To combat these remarkably dirty gadgets, make a habit out of regularly cleaning and wiping them down. Not only will this help keep you healthier and less exposed to germs, but it will also keep dust and grime from gumming up your keyboard. While you’re at it, when’s the last time you’ve cleaned the grime off your earbuds or headphones? If it’s been a long time, disinfect them with some rubbing alcohol and a cotton ball. If you work a desk job, there is perhaps nothing more distracting and irritating than a cluttered desk. Your desk is like the counters and kitchen table of your office, and just as cooking in a kitchen with no counter space is infuriating, so is working with a cluttered desk. Even though cleaning your desk can likely improve productivity, finding time to actually do the cleaning can be hard — it’s a classic workplace catch 22. To minimize the amount of time it takes to clean, strive to make desk cleaning a regular part of your routine. Perhaps, every Friday you start the day by disposing of unnecessary items and organizing work essentials. We’ve all seen the heaping pile of paper on a desk, whether it be our desks or the desk of our neighbor. While this pile might not seem like a distraction, it almost certainly does more harm than good. To prevent this build-up, try filing and processing papers as you go. This can be a difficult process to adhere to at first, but if you establish a system of folders and trays that are clearly labeled and diligently stick to your system, a good habit will form. There are two keys to cleanliness: organization and routine cleaning. If you have trouble with organization, one helpful trick might be to assign a place for everything on your desk. Whether this requires a label or just a good memory will be up to you. After a few weeks of staying true to this organizational rule, you’ll be in the habit of putting things away, making decluttering a second nature task. The colorful array of cheap pens, the magnets, the stacks of cups, the pile of brochures, the free calendars…do you need them? We know, when you were offered these freebies, it probably felt like you absolutely needed them. But in reality, it’s probably just cluttering up your desk, and what you might not realize is that this is also aesthetically and mentally distracting you with superfluous items. To find out if this is the case for you, try adding a minimalist flair to your desk, strive for the less-is-more approach. This may help minimize clutter in the mind and allow you to better focus on the tasks at hand. Although keeping your desk clean and organized is likely a task that will fall on each individual employee, keeping the office cleaned is something you can outsource. In fact, scheduling office cleaning services can help enhance the appearance of your workspace, improve hygiene, increase productivity, and make your workplace safer. Looking for San Antonio office cleaning services? We’ve got you covered! We are a full-service cleaning company specializing in office cleaning, and our cleaning team utilizes their experience and industry-leading equipment to provide superb janitorial services. Read more about us and give us a call today at 210-504-3415 to schedule your free 14-day trial. ©2018 1st Call Cleaning - Do not copy. All rights reserved.